The Global Property Guide looks at inheritance from two angles: taxation, and what inheritance laws apply to foreigners leaving property in Czech Republic: what restrictions there are and whether making a will is advisable. How high are inheritance taxes in Czech Republic? Inheritance received by a qualifying spouse or a close relative is not taxed. Inheritance received by other heirs is generally subject to income tax at a flat rate of 15%. Gifts received by a qualifying spouse or a close relative are not taxed. Gifts to other recipients are generally subject to income tax at a flat rate of 15%. What inheritance laws apply in Czech Republic? Inheritance in the Czech Republic is governed by the laws of the deceased's citizenship. The Czech International Private Law Code provides that the laws of the deceased's citizenship, or country of habitual residence, apply to questions of his/her inheritance. No distinction is made under the Czech Constitution between Czech citizens and foreigners of different countries or religions; however, Czech law does exceptionally provide for derogation from equal treatment of foreigners, if a foreign country discriminates against Czech citizens in preference to its own citizens. The will's form is regulated by the laws of the state to which the devisor is a national at the time the will was made; however, if the will is in accordance with the laws of the country (and not just State) where it was made it will be deemed sufficient. The same holds true for will cancellations. The Czech courts have exclusive jurisdiction over immovable property in every legal proceeding if property is situated in the Czech Republic, even if the property is owned by a foreigner. The decision-making of the Czech courts is always governed by Czech procedural law. 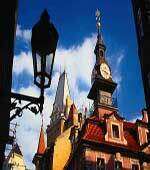 Nevertheless, the Czech courts generally apply the substantive law of the deceased's citizenship. If the law of the deceased's citizenship states that the applicable inheritance laws are those where the property is situated (using the principle of lex rei sitae), then inheritance issues are referred back to Czech law, and the Czech courts then apply Czech substantive law. Inheritance issues are dealt with by the district courts, together with the notaries public appointed to act on behalf of the courts as trustees in inheritance cases. The competence of the courts is determined successively by: (i) the last residence of the deceased, (ii) the last stay of the deceased, or (iii) the location of the deceased's property. If more than one district court begins an inheritance action, the first court to act is considered the competent court. But if an urgent measure must be taken (such as securing property or appointing an inheritance trustee) then any court can be considered competent; and, if all parties agree to delegate to a different district court for reasons of efficiency, then that court would be considered competent. If there are no conflicting issues among the heirs then the average inheritance procedure lasts from three to four months. The Czech Civil Code designates the heirs in cases of intestacy. The fourth group contains grandparents and the grandparent's children - who inherit in the absence of grandparents. The inheritance is equally distributed between the grandparents of the deceased, and if none of the grandparents can inherit (due to no longer being alive), then the property is equally distributed to the children of these grandparents. The heirs of the second group or the third group or the fourth group inherit only if there are no heirs in the preceding group. In the case of intestacy, the heirs of all groups receive equal portions of the inheritance, except for the spouse in the second group. The ratios depend on the number of members in each group. The heirs may also be included in the "inheritance agreement," that modifies the ratios stipulated by law. The inheritance agreement must concern the whole property, must comply with good manners, and must be authorized by the court. Czech law recognizes a reserved portion. Czech law recognizes the right of certain individuals to inherit a portion of the descendant's estate. If executed under the rules of Czech law, the testator's will must respect this legal right, otherwise the will could be invalid. The reserved portion applies first to the deceased's children, then to the other descendants. The minimum reserved portion for minors is the same portion as that required by law (i.e. by the rules of intestate succession). The size of the reserved portion varies according the the number of children. The reserved portion for adults is at least one-half of the portion required by law. Czech law does not automatically recognize a spouse's right to a reserved portion. It is not advisable for a foreigner to make a Czech will. A will made by a foreigner outside the Czech Republic is valid if it meets the requirements of the law of the testator's citizenship, or the law of the country where the will was made. If a foreigner's will is executed according to the laws of his/her nationality, or country of habitual residence, then Czech law is not necessarily applicable, and the Czech courts can apply the whole substantive law of the foreigner. This means that the inheritance provisions required by Czech law, including the reserved portions, do not necessarily apply the estate of a foreigner. It is not advisable for a foreigner to make a will in the Czech Republic, due to the many formal requirements stipulated by the Czech law. Also, several provisions in the Czech Civil Law (for example, the reserved portions) limit the testator's freedom to bequeath property. The formal requirements depend on the type of will being made. To guarantee compliance with the applicable Czech laws, a foreigner should either hire a local attorney at law to write the will or make a notarial will. A notary public has an obligation to register the will electronically. To protect a will from getting lost, it should be registered via a notary public, and be recorded in the Central Register of Wills managed by the Czech Notarial Chamber. Gifts made during the lifetime of the owner may be considered part of the reserved portion. According to the Czech Civil Code, in case of intestacy, the inheritor's amount of inheritance is determined by the legal ratio. The legal ratio could be diminished in proportion to the value of gifts obtained by an inheritor from the deceased, unless the gifts would qualify as common donations. Under certain circumstances, such a setting-off could be applied even in the case where there is a will. This is especially true in a case where the will gives an "unjustifiable" advantage to the inheritor, who had obtained the gifts to the disadvantage of another inheritor entitled to a reserved portion. Legal title of ownership is required in Czech law. Czech law primarily looks to the legal title of ownership (titles, deeds), which embrace all aspects of ownership rights, when dealing with inheritance. In some cases, however, the property in question could be affected by various types of encumbrances that are not on the legal title. These encumbrances, including easements and mortgages, are generally registered in the Cadastral Register of the Czech Republic. If inherited property is subject to an encumbrance, such as an easement or mortgage, the inherited property remains encumbered and is not altered by a change in owner. The new owner generally remains bound by the encumbrance, usually to the benefit of another party. There are statutes that give rise to beneficial ownership rights, and so it is important to have an attorney analyze all the statutes in order to make sure that such rights continue to exist, etc. Rights corresponding to equitable ownership are, in general, registered in the Cadastral Register, and so the owner/inheritor of property affected by such rights should be acquainted with updated extracts from the Cadastral Register. Czech law recognized the common ownership of property by spouses. If each spouse is of a different citizenship, the ownership of their properties is regulated by Czech law. If a spouse dies, the applicable laws of inheritance are those of the deceased's citizenship. However, if the spouse is a Czech citizen, then the separation of property acquired during the marriage is regulated by Czech law. Under Czech law, property acquired during marriage is considered to be equally owned by both spouses, under common ownership principles, unless the spouses agree before the marriage before a Notary Public that the common ownership of the property will not be established. Other exceptions to common ownership during marriage include property gifted to one spouse, and awards from a restitution proceeding. Therefore, if a Czech property owner dies, the residual spouse would receive one-half of the property acquired during the marriage, and the other half of the property would be subject to the inheritance procedure regulated by the deceased's personal law. These legal issues can become very complex and so if they arise we suggest contacting an experienced attorney. Children have a right to inherit property. Under Czech law, children (to include those not born yet) have the legal capacity to be owners and inheritors of property. The Administration of property inherited by a child is fixed by the Family Act and belongs to the child's parents. Parents, as legal representatives, have the fiduciary duty to administer the property in the best interest of the child, until the child reaches the legal age of 18. Normally, the legal acts of parents that relate to the child's property are not subject to control by the authorities. The parents are, however, accountable to the child and liable for damages if they breach their fiduciary duty. Parents generally need a court's approval for acts relating to the property of the child that qualify as "beyond ordinary administration." For example, the selling of a child's immovable property by the parents would need a court's approval. The Family Act further sets out specific cases where a court-appointed guardian is necessary. Examples include instances where the parents are threatening the property of their child or where both parents are deceased. Czech law fails to expressly provide for the appointment of a guardian in a will. Appointing a guardian is not excluded by Czech law either, and so it is up to the Czech Courts to rule on this matter. The appointment of a guardian in the will is therefore not binding on the court, but it usually plays an important guide in the court's decision. Ownership of property by foreigners is still subject to restrictions, under Czech law. These restrictions have, however, been diminishing since the Czech Republic's accession to the European Union in 2004. Under Article 17 of the Foreign Currency Act, inheritance by a rightful owner is a valid title to acquire ownership to both farmland and other immovable property. How high is income tax on Czech residents?